Is Money, The Main Cause Of Frustrated LIfe? 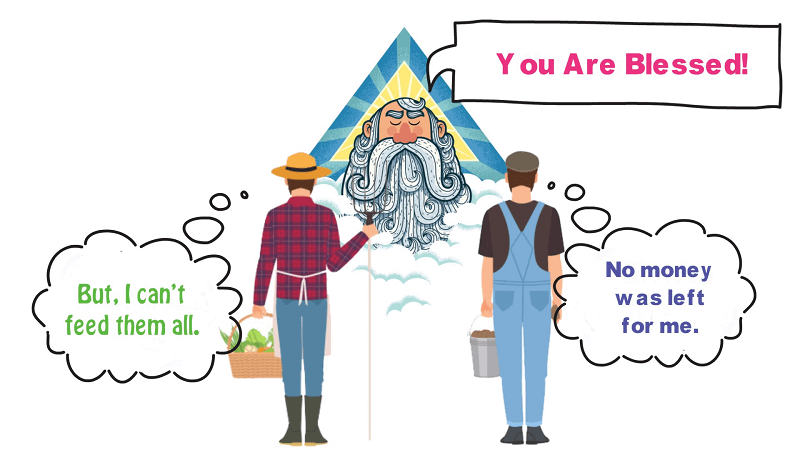 Let’s Start with our very relatable story – Two farmers in a village died at the same time and went to god. There God told them, I will give you a chance to re-born so tell me, what you want to be? This is a great offer, we wish to reborn as Human Again. But so quickly can’t imagine. But among the two farmers, One was too Frustrated. Looking at his Frustration God first asked him what you want to be? Then, with his frustrated mind, he spoke “My lord what you did with my past life? look at my situation, I have nothing. In my whole life I worked like a slave and gained some money but that money was also taken by someone. no money was left for me. So, my lord, I would request you in this life you make me something special that I will always only gain and never lose anything.” After thinking a lot God said, “You are blessed”. Now God went to the second person. God saw that this Person is very Happy. His expressions were opposite from the first person. God asked the second person what you want? Then he replied “my lord you gave me so many things in life – a beautiful family, a lovely house, a good job, no scarcity of food, now what shall I ask for. Yes, but I was having a small wish. in my house many times many hungry beggars came for food. But I can’t feed them all. So, you do something, that from next time if anyone comes to my door for food. He or she should not go with the empty hand.” God said, “You Are Blessed”. Now I think you all have understood who is going to re-born with what identity. Comment us your answer. The first and correct answer will be Pinned. Anyways friends, we all say “I am not happy, My life is full of problems, Things are not going right. Frustration and all..” Do you know Where the problem is? How can we be Happy?. We don’t Try, we always find excuses. So, today in this video I will explain why our life is Frustrated.and you will yourself find a solution. But before that, if you don’t want to read this content, then you can watch our videos. We’ve uploaded in three languages (Bengali, Hindi & English). Friends, According to Harvard University researchers, Money is not the Main reason of Unhappiness. Actually, the main reason of a Frustrated life is – Relationship. Do You believe it or Not? But Harvard University Researchers had said- People with a Good relationship live a happy life. Whereas people owning a bad and unstable relationship live a frustrated and unhappy life. You may think that after 75 years of research they just gave us this result. We also know these things. But this small word has heavy Conclusion and is very important Which you have never thought but this research has shown us. So, To Build a strong Relation what are the 3 important things? Come let’s know. No.1 : Understanding: To build a strong relationship The first important thing is Understanding. You may say What is new in understanding? We have heard about this many times. You know, your knowledge is not at all important here, here the important thing is how much you have applied that knowledge in your life. For example, you know how to run a cycle, but you can not run it, similarly, you are saying you know very well what is understanding but there is no understanding in your relationship, then what is the advantage? There is no benefit. To make a strong relation build understanding. No.2: Know Your Partner Properly: If you know your partner properly, It may happen Your partner may lie to you, so Without making it an Issue. You have to understand or figure out why your partner lied to you. It may happen that your partner loves you a lot that’s why he or she lied, Your wife had a new hairstyle from the Parlour, and she looks very bad in that hairstyle, but to feel her good you say her that she looks very beautiful, so this much lies are ok to go with, isn’t it? No.3: Don’t Wait for Return, Just do your best: Now a question may arise in your mind. That You understand your partner. But, why he/she doesn’t understand you? Actually, We think ourselves to be too forward. And others to be fool..Just think the contrary to that, if your partner is too understanding, he understands you when your mood is not good. When You need help and support he or she gives you support. Then, can you understand your partner or not? Obviously Yes, then why are you thinking, that your partner will not understand you. If you understand the point of view of your partner then automatically your partner will also understand your point of view, there is no need to make him understand and there is also no need to think that he is a fool. Your Main problem is Ego. we wait “He will talk with me first, then I will talk.” What is the need of so much ego? The choice is up to you, it totally depends on you how you want to make or build your relationship. For example, Like – “To gain Something, we have to sacrifice many things”. Similarly, to get joy and happiness – at first, you have to give happiness and joy. Rather than thinking that someone will carry happiness and joy for you – Try to keep others happy. You will find your happiness in them. So guys! The choice is yours, if you want to be happy, then understand your partner first – without any judgment. And make your relationship strong and don’t wait for the return, just give give give & give. One Day you will surely get a return. So, Friends, That’s it for today. See you again on next Saturday at 7:00 PM. Till then, Think Positive, Do Positive & Go Ahead.